Sydney airport is located approximately 10 kilometres from Sydney's central business district and is the busiest airport in Australia. Take the stress out of your travel by choosing to stay within the airport precinct. Within a few minutes' drive or walk from the domestic and international terminals you will find a range of accommodation options to suit your budget. Catering to business and leisure travellers staying at a Sydney Airport hotel is perfect for travellers arriving late, departing early or have a short stopover. For travellers that do have a little time up their sleeve or need to travel into Sydney`s central business district for business, the hotels surrounding Sydney airport are just a short drive to the city or you can take advantage of the public transport network. If driving to the city, in light traffic you can expect a 25-30 minute drive time. Alternatively, you can sit back and relax on the train which is a short 13 minute journey from the city. 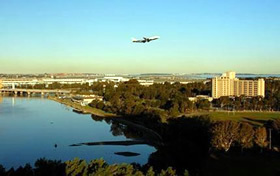 Sydney Airport accommodation is a great option for travellers who need convenience, comfort and modern facilities located close to the airport.